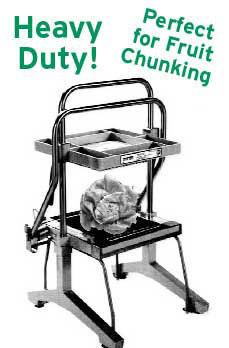 In a single swift motion the Lettuce Chopper/Fruit Chunker cuts or slices whole heads of lettuce into uniform pieces. Up to 50 heads in 5 minutes, without bruising, without waste. Frame is Stainless steel. Choose between 1" squares or 1" slices. Includes one upper and one lower blade. SKK2 27" x 17" x 17" 26 lbs. Replacement Blades Available: model number 25506-Upper and 25507-Lower.